Home Tags Posts tagged with "iraq crisis"
Hilary Clinton has hit back at her Republican rival Jeb Bush over who is responsible for instability in Iraq and the rise of the Islamic State (ISIS). On August 11, Republican presidential hopeful Jeb Bush accused the Obama administration of a “premature withdrawal” of US forces from Iraq in 2011, with “grievous” costs. Hillary Clinton replied by saying it was Jeb Bush’s brother, George W. Bush, who, as president, negotiated a US withdrawal. The US-led war in 2003 has been followed by years of turmoil. Jeb Bush called the withdrawal of US forces in 2011 a “fatal error”, destabilizing the nation and setting the stage for the rise of the Islamic State. “So eager to be the history-makers, they failed to be the peacemakers,” Jeb Bush said of Barack Obama and Hillary Clinton, who was Obama’s secretary of state from 2009 to 2013. “Rushing away from danger can be every bit as unwise as rushing into danger,” he told a rally in California. 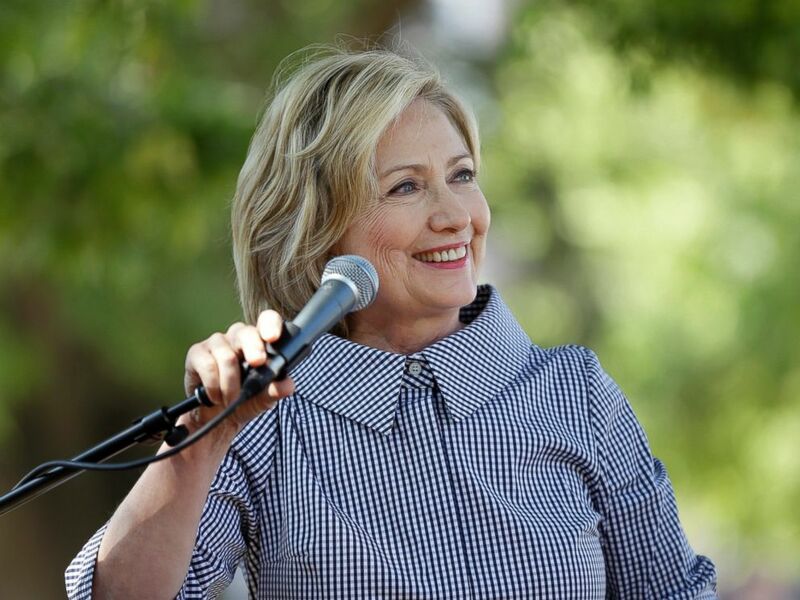 On the campaign trail in Iowa on August 15, Democratic presidential hopeful Hillary Clinton responded by saying Jeb Bush “should present the entire picture. [That]… includes the agreement George W. Bush made with the Maliki government in Iraq that set the end of 2011 as the date to withdraw American troops”. “I can only wonder whether he either did not know that or thought that other people would not be reminded of that,” Hillary Clinton went on. Earlier in the campaign Jeb Bush was ridiculed for struggling to say whether he would have approved the Iraq invasion “knowing what we know now”. At first, he said he would, then he said he wouldn’t engage in “hypotheticals” and finally he announced he would not have. Hillary Clinton herself voted in favor of the invasion in Iraq in 2002, and has since both defended the decision and acknowledged she “got it wrong”. President Barack Obama has warned it is “going to take some time” to help Iraqi people overcome the jihadist-led Sunni rebellion and stabilize their country. It would be a “long-term project” to revamp and resupply the military and build support among Sunnis, he said. Barack Obama stressed that progress would depend on Iraqis coming together and forming an inclusive government. 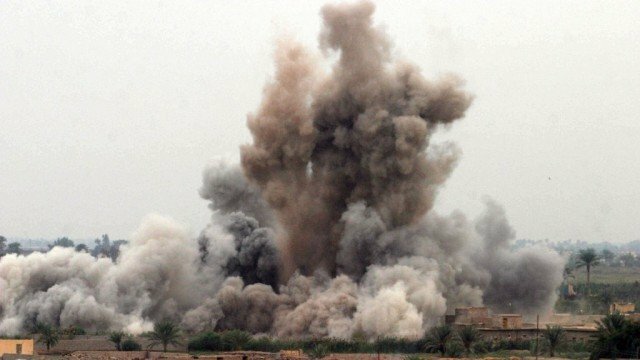 Barack Obama said air strikes on Friday – the first time US forces have been directly involved in a military operation in Iraq since they withdrew from the country in late 2011 – had destroyed IS arms and equipment. One C-17 and two C-130 transporters dropped 72 bundles of supplies, according to the Pentagon. They were escorted by F/A-18 Hornet jets launched from the USS George H.W. Bush aircraft carrier in the Gulf. “We feel confident we can prevent [IS] from going up the mountain and slaughtering the people who are there,” Barack Obama said. France would begin deliveries of first aid equipment to Iraq in the next few hours, President Francois Hollande’s office announced. IS fighters meanwhile began hoisting their black flags at the Mosul dam, Iraq’s largest, and patrolling its perimeter, days after seizing the facility. Barack Obama said a long-term strategy was needed to confront the jihadists. US Secretary of State John Kerry has arrived in the northern Iraqi city of Erbil to hold talks with Kurdish leaders as Sunni rebels continue their offensive. 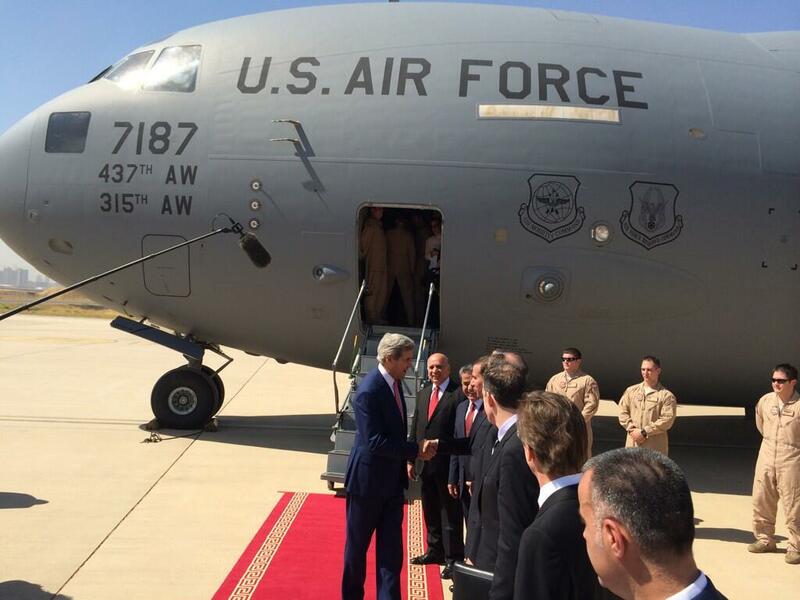 John Kerry’s trip comes a day after he visited Baghdad and pledged US support for Iraqi security forces. He said Iraq faced a moment of great urgency as its very existence was under threat. 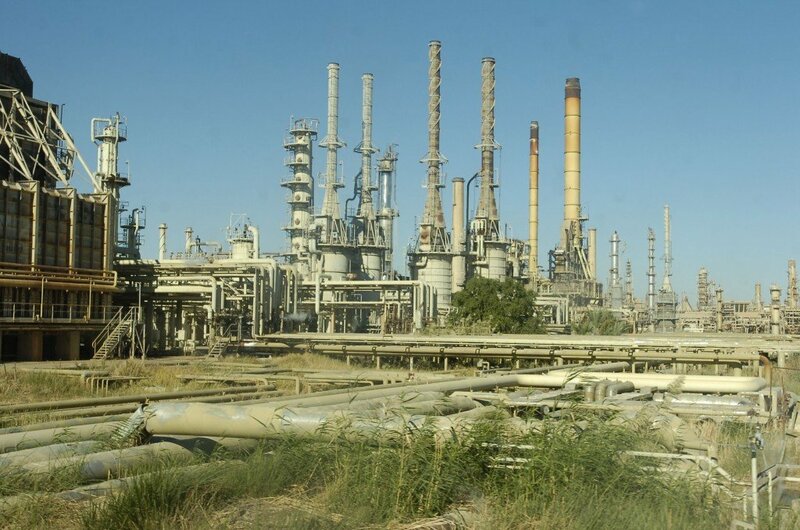 The Sunni rebels say they have fully captured the country’s main oil refinery at Baiji, north of Baghdad. John Kerry’s meetings with Kurdish leaders come as Iraqi Kurdish President Massoud Barzani strongly suggested that his region would seek formal independence from the rest of Iraq. Speaking on Monday, John Kerry said Iraq’s PM Nouri al-Maliki and other leaders had committed themselves to the “essential ” step of forming an inclusive unity government by the end of the month. Insurgents, spearheaded by Islamists fighting under the banner of the Islamic State of Iraq and the Levant (ISIS), have overrun a swathe of territory in the north and west including the second-biggest city, Mosul. 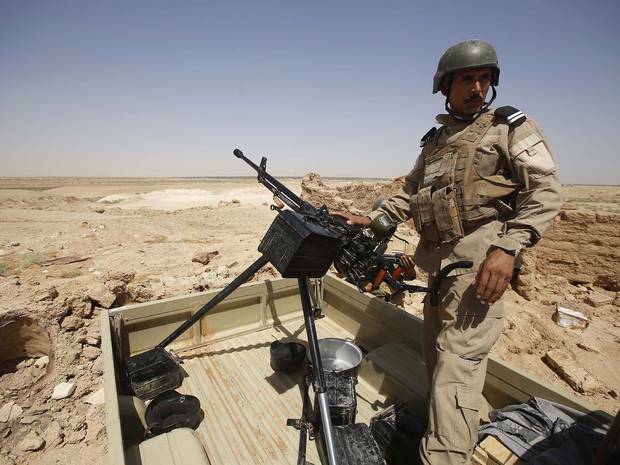 They are bearing down on a vital dam near Haditha and have captured all border crossings to Syria and Jordan. 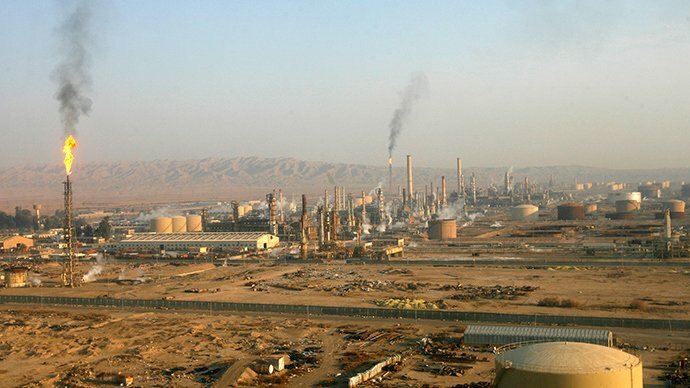 The Baiji refinery, in Salahuddin province, had been under siege for 10 days, with militant attacks repulsed several times. The complex supplies a third of Iraq’s refined fuel and the battle has already led to petrol rationing. A rebel spokesman said it would now be handed over to local tribes to administer, and that the advance towards Baghdad would continue. Speaking at the US embassy in Baghdad, John Kerry said US support would “allow Iraqi security forces to confront [ISIS] more effectively and in a way that respects Iraq’s sovereignty”. “The support will be intense, sustained, and if Iraq’s leaders take the steps needed to bring the country together it will be effective,” he said. Iraq’s government has lost control of its western borders after Sunni militants reportedly captured crossings to Syria and Jordan. Officials said the rebels took two key crossings in Anbar on Sunday, a day after seizing one at Qaim, a town in the province that borders Syria. The strategically important airport in the northern town of Tal Afar has also reportedly fallen to the rebels. ISIS-led militants have cut a swathe through parts of Iraq. Since the fall of Mosul in early June, ISIS – the Islamic State in Iraq and the Levant – have helped win large areas in the west and north. They have taken four strategically important towns in the predominantly Sunni Anbar province – Qaim, Rutba, Rawa and Anah – in the last two days. Gunmen reportedly captured the border posts of al-Waleed, on the Syrian frontier, and Turaibil, on the Jordanian border, on Sunday after government forces pulled out. The capture of frontier crossings could help Isis transport weapons and other equipment to different battlefields, analysts say. The funeral of a senior army officer who was killed in the fighting for Qaim on Friday was targeted by a suicide and car bomb attack in Ramadi. At least six people were killed as they gathered to mourn Brig. Gen. Majid al-Fahdawi. Earlier, US Secretary of State John Kerry, speaking in Cairo, singled out ISIS whose “ideology of violence and repression”, he said, “is a threat not only to Iraq but to the entire region”. Calling it a “critical moment”, John Kerry urged Iraq’s leaders “to rise above sectarian motivations and form a government that is united in its determination to meet the needs and speak to the demands of all of their people”. Iraq forces are battling Sunni militants for control of the country’s biggest oil refinery. A military spokesman said troops had repelled repeated attacks by the militants, led by the jihadist Islamic State in Iraq and the Levant (ISIS). Forty assailants were killed overnight and on Wednesday, he added, denying the facility was close to being overrun. But some workers said the militants had seized most of it and that troops were concentrated around the control room. It comes as President Barak Obama considers a formal request from Iraq’s government for air strikes against the militants, who have seized several northern cities and towns since last week. ISIS-led militants launched an assault on the Baiji refinery, about 130 miles north of the capital Baghdad, early on Wednesday. Workers trapped inside said the attackers had breached the perimeter and destroyed one of its fuel tanks. Some said they had taken control of most of the facility. Video footage showed smoke billowing from the refinery and the black flag used by ISIS flying from a building. However, officials insisted that troops had resisted the advance. Nearly all the 15,000 workers at the refinery and 100 foreign experts left on Tuesday when the plant was shut down in anticipation of the attack. On Thursday morning, the remaining 250 to 300 workers were evacuated under an agreement brokered by local tribal leaders, one of the workers told the Reuters news agency. The battle over Baiji, which supplies much of the country’s domestic fuel, has sparked fears that Iraqis will soon experience long lines at petrol pumps and electricity shortages. 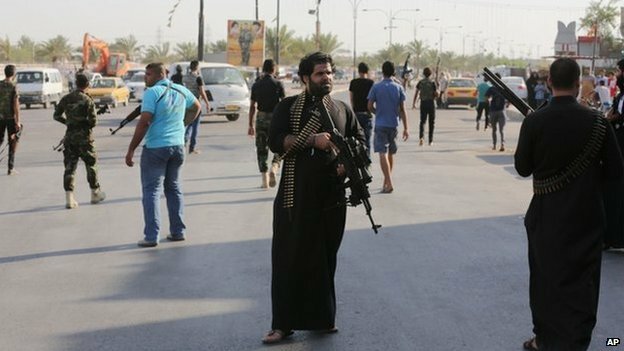 On Wednesday there were fierce clashes in the Baquba, about 37 miles north of Baghdad, as jihadists again tried to enter the city centre and seize its prison. Shia militiamen have been sent to assist in the defense of the capital of Diyala province, which has effectively become a frontline, and the nearby city of Samarra, site of a major Shia shrine. PM Nouri al-Maliki has tried to assure Iraqis that the momentum is shifting. 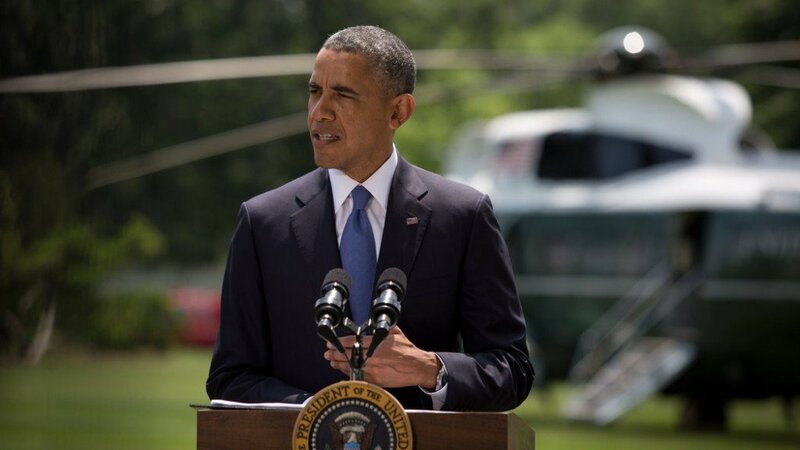 The Iraqi government is awaiting President Barack Obama’s decision on air strikes. On Wednesday, the chairman of the US Joint Chiefs of Staff, Gen. Martin Dempsey, warned that the US military still lacked sufficient intelligence to take action. He told a congressional hearing that pilots would have difficulty knowing who they were attacking from the air. ISIS has exploited deep resentment among Iraq’s minority Sunni Arabs, who have long accused Nouri al-Maliki of discriminating against them and monopolizing power. According to Republican Senator Mitch McConnell, President Barack Obama has told Congressional leaders he does not need lawmakers’ approval for any action in Iraq. 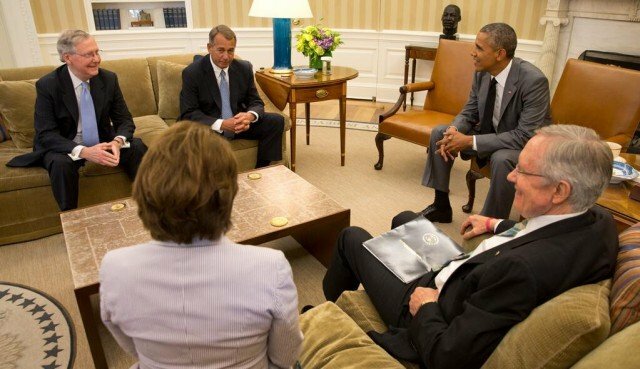 Senator Mitch McConnell was speaking after a meeting between President Barack Obama and senior members of Congress. Iraq has asked for US air strikes against advancing jihadist militants, who have seized key cities and towns. However, correspondents say any decision on military support from Washington could hinge on political changes in Iraq. Vice-President Joe Biden discussed possible “additional measures” that could help “roll back the terrorists’ advances” with Iraqi PM Nouri al-Maliki on Wednesday, but also the need for national unity. The Obama administration has shown signs of frustration with Nouri al-Maliki – a Shia Muslim who has long been accused of discriminating against the Sunni Arab minority community and monopolizing power. Barack Obama met Congressional leaders at the White House on Wednesday to discuss the US response to recent advances by the Islamic State in Iraq and the Levant (ISIS). Speaking afterwards, Senator Mitch McConnell said the president had “indicated he didn’t feel he had any need for authority from us for steps that he might take”. Correspondents say the White House has so far avoided the thorny question as to whether it needs Congressional authority for any military action in Iraq. Experts say Barack Obama has several options, including citing the Authorization for the Use of Military Force (AUMF) against al-Qaeda and its associated forces passed by Congress in 2001; the 2002 AUMF that led to the invasion of Iraq; and his own powers as commander-in-chief. Last year, President Barack Obamaabandoned plans for punitive military strikes in Syria following a deadly chemical weapons attack once it became clear that Congress would not give its backing. Administration officials say the president may be able to act unilaterally in Iraq because its government has requested US air strikes against ISIS, which seized the second city of Mosul last week and is advancing southwards towards Baghdad. ISIS and their Sunni Arab allies are reported to be advancing in Diyala and Salahuddin provinces after they overran Iraq’s second city, Mosul, last week. 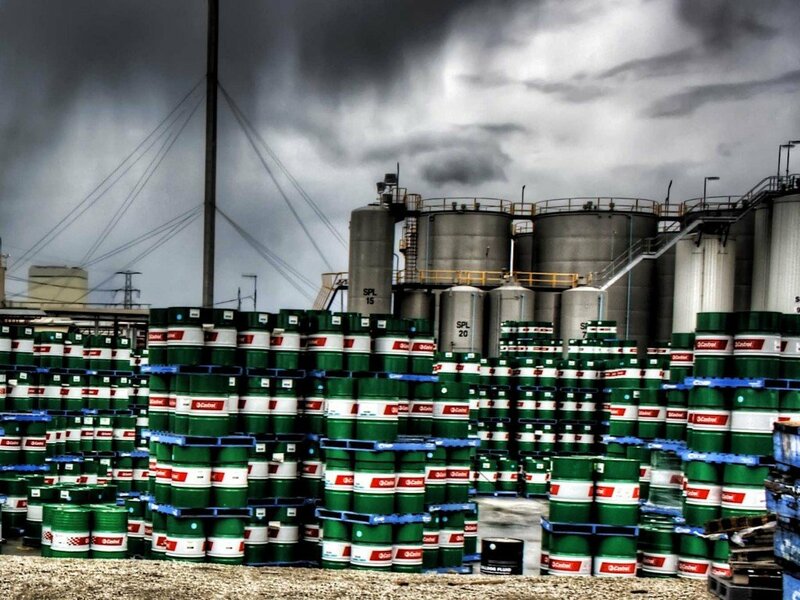 They have also launched an assault on Iraq’s biggest oil refinery at Baiji, north of Baghdad. The administration has not officially responded to Iraq’s request for air support in its response to the offensive. Iraqi Islamist militants have invaded the country’s biggest oil refinery, after pounding it with mortars and machine guns from two directions. 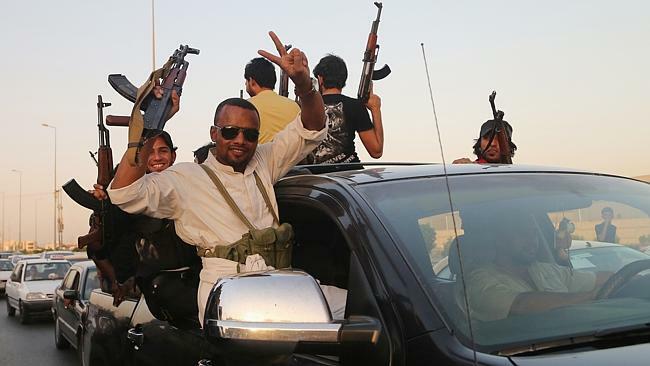 An official quoted by Reuters said the militants now controlled 75% of the Baiji refinery, 130 miles north of Baghdad. Government forces have made new air strikes on militants advancing towards the capital. Fighting is also reported in the western city of Ramadi. The government is battling to push back ISIS (Islamic State in Iraq and the Levant) and its Sunni Muslim allies in Diyala and Salahuddin provinces, after the militants overran the second city, Mosul, last week. PM Nouri al-Maliki appeared on television with Sunni Muslim and Kurdish leaders on Tuesday to issue a call for national unity in the face of the advance – they demanded that non-state forces lay down their arms. However, such a call is unlikely to have much effect as Nouri al-Maliki has openly sponsored the formation of Shia Muslim militias to fight alongside regular Iraqi troops. Hundreds of people have been killed since the start of the militant offensive last week, many of them believed to be captured soldiers publicly shot by ISIS-led firing squads. During fighting in the city of Baquba this week, 44 prisoners were killed inside a police station in unclear circumstances. 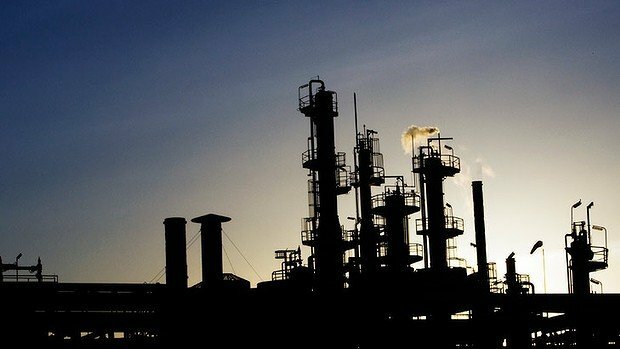 The attack on the refinery started at 04:00 a.m. from outside two of the three main entrances to the refinery, according to Reuters. Smoke rose from a spare parts warehouse and some stores of oil were reportedly destroyed. “The militants have managed to break into the refinery,” the unnamed official told Reuters from inside the refinery. Foreign personnel were evacuated earlier but local staff reportedly remained in place, with the military defending the facility. 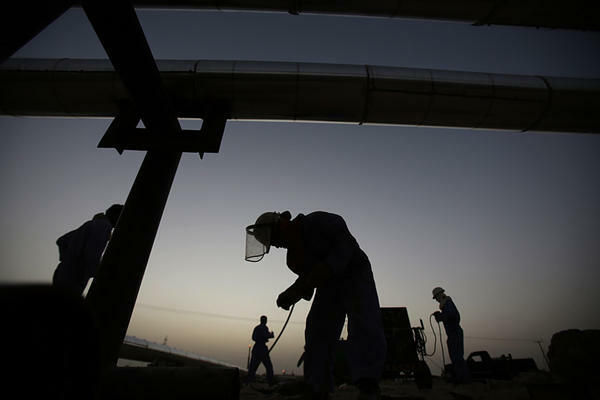 Baiji accounts for a little more than a quarter of the country’s entire refining capacity, all of which goes toward domestic consumption for things like petrol, cooking oil and fuel for power stations, an official told AP news agency. Militants in the western province of Anbar, where the capital is Ramadi, said they had made advances, with a number of police stations near the town of Hit going over to dissident tribes. Further north, the Iraqi government said it had recaptured the citadel in the strategic town of Tal Afar, where militants were said to have taken control on Monday. Using unusually strong language, Nouri al-Maliki accused Saudi Arabia – which is largely Sunni – of backing ISIS. He also fired four army commanders for failing to halt the sweeping advance by the militants. They included the top commander for Nineveh, the first province where ISIS fighters made major gains. Heavy clashes took place between Iraqi government forces and Sunni Islamist militants who have made major advances in the past week. Reports say parts of the city of Baquba – just 37 miles from Baghdad – have been taken over by the rebels. The US is deploying up to 275 military personnel to protect staff at its huge embassy in the capital. Reports from Baquba – capital of Diyala province on the northern approaches to Baghdad – say rebels are reported to have taken over several quarters and captured the main police station, seizing many weapons. At Tal Afar, a strategic city west of Mosul in the province of Nineveh, there are reports that reinforcements have arrived to boost government forces trying to recapture the town from rebels. The Iraqi air force is said to have been carrying out strikes in the area. The city of 200,000 people, which has a mixed Sunni and Shia population, lies between Mosul and the Syrian border and was taken just before dawn on Monday. In Anbar province to the west of Baghdad, Sunni militants shot down a government helicopter near the city of Falluja, and say they destroyed several tanks in fighting there. They also say army forces fled from a military base near Ramadi, the provincial capital. Qasem Suleimani, the commander of an elite unit of Iran’s revolutionary guards, is reported to be in Baghdad, helping military leaders and Shia militias co-ordinate their campaign against the rebels. In Vienna, US officials held brief discussions about Iraq with their Iranian counterparts at a meeting about Tehran’s nuclear program, but American officials have been quick to dismiss reports of military collaboration with a major foe. In a letter to Congress, President Barack Obama said the 275 military personnel being sent to Iraq would protect US citizens and the embassy in Baghdad, and would remain there until the security situation improved. A White House statement said that their main role would be to help embassy staff to relocate to US consulates in the cities of Basra in the south and Irbil in the north, and provide airfield management and security. President Barack Obama has already ruled out sending in ground troops to fight alongside Iraqi government forces, but drone strikes remain a possibility. The aircraft carrier USS George HW Bush has been deployed to the Gulf, accompanied by two more warships. The UN says that ISIS fighters have carried out hundreds of summary executions since their offensive began last week. UN human rights chief Navi Pillay said that systematic killings in the north of the country “almost certainly amounted to war crimes”. The northern Iraqi buffer city of Tal Afar has been seized by Sunni militants, officials and residents say. Sunni militants led by ISIS – the Islamic State in Iraq and the Levant – captured key cities including Mosul and Tikrit last week, but some towns were retaken. Fighting in Tal Afar began on Sunday, with mortar shelling of some districts as militants tried to enter the city. The Iraqi military setback came as the US said it was considering direct talks with Iran on Iraq. President Barack Obama is weighing up options on action to take in Iraq. Tal Afar is a mainly Shia and ethnic Turkmen city, and seen as a buffer against militant-controlled territory in Iraq and Syria. The Iraqi government claims to have “regained the initiative” against an offensive by Sunni rebels. Earlier, Iraqi army spokesman Lt. Gen. Qasim Ata said the military had scored successes against the militants in several areas, killing 279 of them. The figure could not be independently verified. Local TV stations say government helicopters carried out a raid during the night on a military base near Mosul, which was captured by the militants last week. The United States has begun evacuating some diplomatic staff from Baghdad, moving them to Kurdish-controlled territory in the north-east and to Basra in the south. The Sunni extremist group in Iraq has posted photos online that appear to show mass executions of Iraqi soldiers. The army personnel are pictured being led away and then lying in trenches before and after their “execution”. Iraqi military spokesman Lt. Gen. Qassim al-Moussawi said the pictures were authentic and depicted events in Salahuddin province. However, the images’ authenticity has not been independently confirmed. 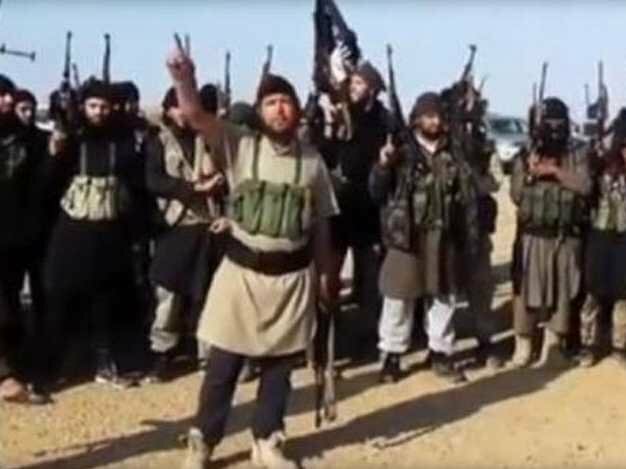 Their emergence came as the Iraqi government claimed to have “regained the initiative” against the offensive by Sunni rebels led by ISIS – the Islamic State in Iraq and the Levant. The pictures, apparently posted by ISIS, are said to show what happened to soldiers after the group took over an army base in Tikrit following the surrender of the garrison there. Video footage, apparently filmed earlier, shows many hundreds of men being marched off from near the Speicher base, with the voice on tape saying they were soldiers who had surrendered at the facility. Earlier, Iraqi army spokesman Lt. Gen. Qasim Ata, said the military had scored successes against the militants in several areas, killing 279 of them. The figure could not be independently verified. There were reports of heavy clashes round the city of Tal Afar, west of Mosul, with mortar shelling of some districts as militants tried to enter the city. 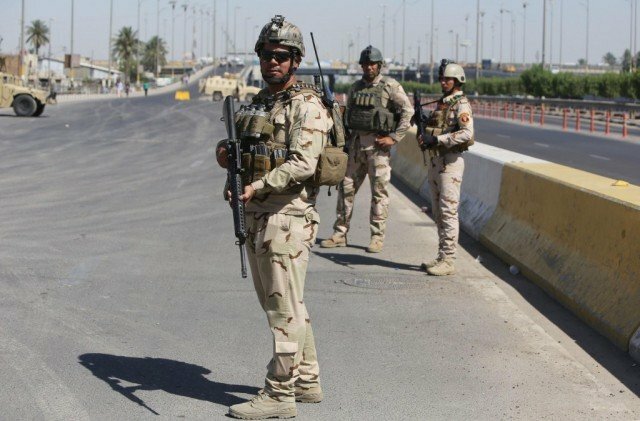 Washington remains concerned at the security situation in Iraq and has announced it is increasing security at its embassy in Baghdad but relocating some staff to safer areas. The US embassy would remain “fully equipped to carry out its national security mission”, the state department said. 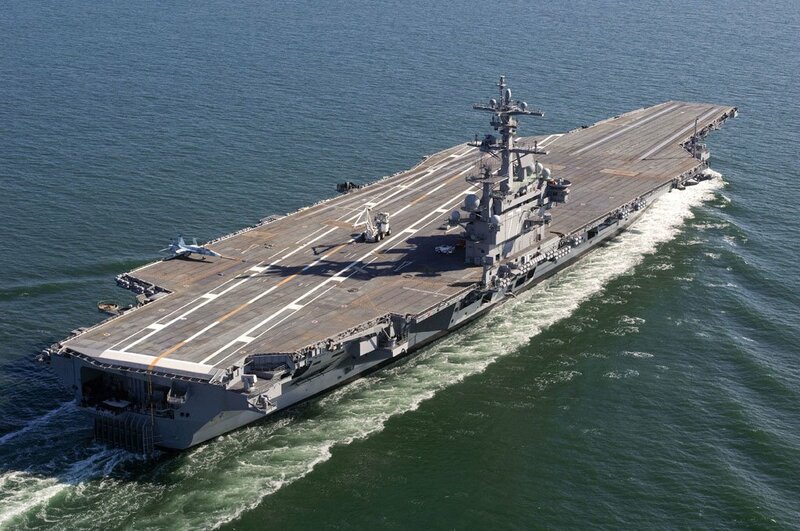 The USS George HW Bush aircraft carrier is being deployed to the Gulf, accompanied by two more warships. However, the US says no US troops will be deployed on the ground in Iraq. 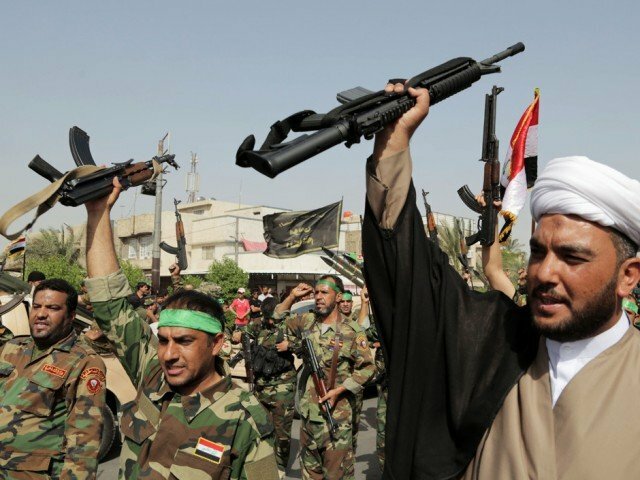 Neighboring Iran has offered direct assistance to Baghdad, but denies sending troops. However, there are reports of more than 130 Revolutionary Guards on hand to provide training and advice. The US is sending a major warship into the Gulf to provide it with military options should the situation in Iraq deteriorate further. US Defense Secretary Chuck Hagel ordered the USS George HW Bush, which carries dozens of fighter jets, to be moved from the North Arabian Sea. Meanwhile, Iran says it could be prepared to work with the US to fight Sunni insurgents in Iraq. The insurgents have seized several cities and are threatening Baghdad. Fighting under the banner of The Islamic State in Iraq and the Levant (ISIS), they regard Iraq’s Shia majority as “infidels”. State forces and Shia militia are reported to have ousted rebels from two towns in Diyala province north-east of Baghdad. But an air strike on the town of Jalawla killed seven Kurdish fighters by mistake; they had earlier moved in to positions evacuated by the Sunni rebels. President Barack Obama has said he will take several days to decide what action to take over Iraq, but insisted that no US troops will be deployed. The aircraft carrier USS George HW Bush will be accompanied by the guided-missile cruiser USS Philippine Sea and the guided-missile destroyer USS Truxtun. They were due to arrive in the Gulf late on Saturday. Secretary of State John Kerry has called on Iraq’s political leaders to put their differences aside to defeat the Islamist offensive. John Kerry urged the government to ratify recent election results without delay and stick to a constitutional time-frame to form a new government. Correspondents say the US is frustrated with Iraqi PM Nouri al-Maliki and his Shia-led government for ignoring the concerns of Sunnis and Kurds. Fears of ISIS sparking a wider Sunni uprising have increased with reports that other groups have joined the insurgents.